Are you ready for another Summer Stamp Off???? We're back with our 2nd half of the Summer Stamp Off Design Call! We are so excited to see what new talent shows itself this quarter! We are looking to fill 3 spots for the rest of the summer and we want you to submit design applications! We have to take a moment to say thank you to our first Clearly Crafty Crew....they designed some beautiful cards and projects! Applications are being accepted and considered through the end of the day June 12, 2010. THIS IS THE DEADLINE FOR APPLYING. The term will be be 3 months (August, September, and October). The term begins as soon as you accept the invitation, and continues through October 27, 2010. Every applicant will be notified on or before June 15th, thanking you for the entry, regardless if you are selected or not. Selected Designers announced publicly June 28, the first day of July sneak previews. You must have a public gallery at SCS and be familiar with their daily challenges. An optional gallery, in addition to the above, is PCP. 2. Posting Sneak Peeks on your blog as well as participating in at least 2 challenges throughout the month on sites such as Splitcoast, Papercraft Planet, or other challenge blogs. 3. The Clearly Crafty Crew will join the exclusive CDS DT discussion forum during their term, and receive a store discount. 4. Designers will be required to upload all quality photographs of projects (in addition to your own blogs/online galleries) to the exclusive CDS DT gallery. Log ins and instructions will be provided. We are doing things a little bit differently this time just to keep things fresh! We are throwing out a challenge to you to get your creative juices flowing. 3. Use one type of embellishment on your card/project. If you'd like to be considered for this term email mypaperhaven@gmail.com with the following requirements. 2. LINKS to your posted Challenge Card plus 1 or 2 recent handstamped artwork. Please send direct links to posts, not general main page blogs, and please do NOT attach photos to the email. 3. Include your name, state or province you reside in and a brief note why you think your talent is a fit with CDS. 4. DEADLINE for applying: Saturday June 12, end of the business day, CST, 9 pm. Can you believe it!? We had ANOTHER tie! Congratulations to our two winners! We look forward to seeing what you create with your new Clear Dollar Stamps! Do you love all of our Guest Designer Challenges? Do you love New Challenges? We have a NEW PROGRAM starting this month....you won't want to miss it! The announcement will be made on September 10th! Make sure to check back for all the details! SEPTEMBER 2009 GUEST DESIGNER CHALLENGE!!!! This is going to be an EITHER / OR Challenge! You may EITHER use the colors, OR use sketch, OR use both together. The SAME keyword should be used for whatever you decide to do. Panels A, B and D may be any shape. Number your comment by finding the last commenter's number and adding 1.
include a LINK directly to your entry (If you upload to SCS, include this KEYWORD: CDSGDC0909) If post is on your blog, please make your link directly to your post and not just your general blog. At this time, we can only accept entries from those residing in Canada or the U.S, due to shipping times. Announcing Guest Designer for August! And we have a TIE again! Announcing the July Guest Designer! You can go to Angel's blog here. July Guest Designer to be announced tonight! Just a little note that we are a tad bit behind due to the 1st day of the month, but we WILL be selecting and announcing the July Guest Designer this evening! Thank you for your patience! This month we decided to have two guest designers! Rebecca Ednie & Dawn Burnworth! You can go to Rebecca's blog here. You can go to Dawn's blog here. Oh, and a little note to Rebecca, the judges do read the notes you leave for us! LOL! That gave me a chuckle! 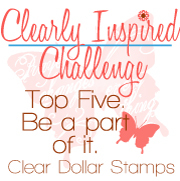 Ladies, please email me at Lori@ClearDollarStamps.com and we'll get you started!